Grace Castelino '20 gets ready to dive in. 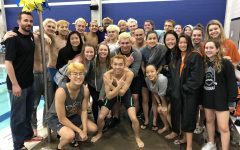 Showing off their traditional bleached hair and orange spirit cone, the swim and dive team conquered at the 11-6A District Championships on Saturday, Jan. 26. The boys captured a runner-up title while the girls placed third. With the realignment and addition of new teams into the district, the boys fell short of their tenth consecutive District title, however the team still advanced 19 athletes to Regionals. The meet began with an invigorating win by the girls’ 200-yard medley relay. 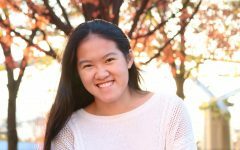 The team fell to fourth by the third leg of the relay, however anchor KyAnh Truong ‘21 swam her freestyle leg in 21.98 to clinch the win — a time that places her among elite swimmers in the country. 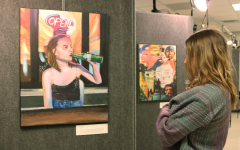 The team, composed of Grace Bradford ‘20, Jackie Liu ‘22, Evelyn Ngo ‘19, and K. Truong, is expected to be a state contender. The boys relay found similar success, nabbing a runners up title with a team of Tai Zhang ‘19, Benji Truong ‘21, Joshua Louie ‘20, and Caleb Farris ‘20. Ethan Riser ‘19, Zhang, and Louie all qualified later individually for the next round of competition by placing in the top six of the 200-yard IM race. Running concurrent with the swimming events, the Warrior divers prevailed in the 1-meter diving competition. Sophomores Sami Greisdorf, Grace Forshay, and Lauren Ogle swept the podium to take first, second, and third. “Our divers were just dominant. 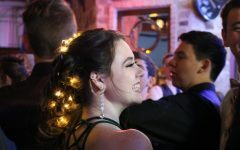 Sami’s got the most experience and she kind of lead the way for us there,” Coach McBrearty said. Continuing her commanding District run, K. Truong snagged another first place win in the 50-yard freestyle with a time of 22.69. Freshman Ayame Castel finished fourth to punch her ticket to Regionals in the same event. In the boys’ race, juniors Nathan Early and Farris placed within the top six to score points for their team and advance. 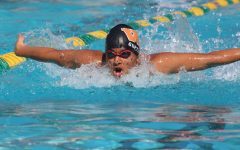 The 100-yard butterfly race saw success in both the girls’ and boys’ races; Ngo finished second while Riser, Louie, and Nathaniel Thomas ‘20 took respective places of first, fourth, and sixth. 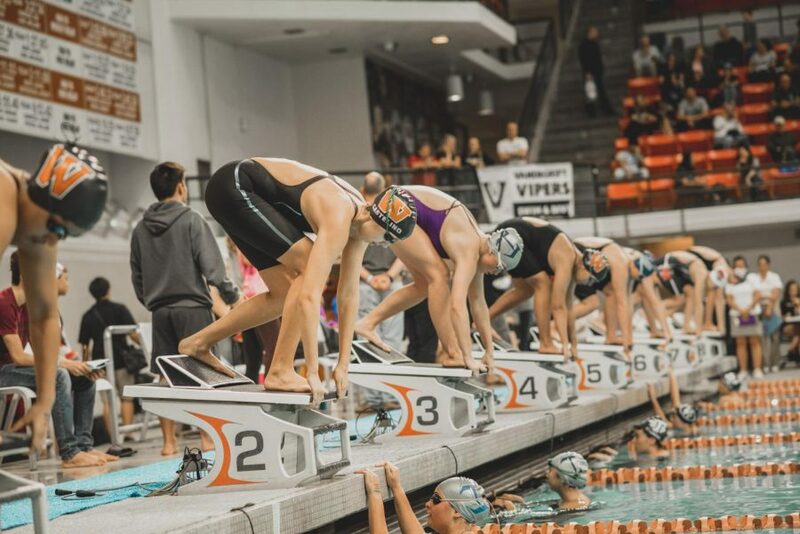 Underclassmen K. Truong and Castel added more points to their team’s scoreboard in the 100-yard freestyle event, in which the girls placed second and sixth. Early captured another race to swim at Regionals with his fourth place finish in the same event. In the longest race of the meet, the 500-yard freestyle, Shreyush Shankar ‘21 dropped more than eight seconds from his seed time to finish fourth. The Warriors’ relay teams kept their dominance in the pool in the 200-yard freestyle relay; the girls’ took first and boys’ captured second, similar to the first events of the meet. The next event, the 100-yard backstroke, sent Bradford to Regionals with her fifth place swim. Both Zhang and Andrew Seale ‘20 placed top six in the boys’ race. Seale, who was seeded ninth, did not compete in the fastest heat. It was only after the last heat finished that he realized he edged out four other swimmers to place fifth. In the last individual swim of the meet, the 100-yard breaststroke, B. Truong nabbed sixth to add a second race to his events at Regionals. Both the boys’ and girls’ relay teams finished third in the 400-yard freestyle relays, concluding the meet with an addition of 12 points to each team’s score. 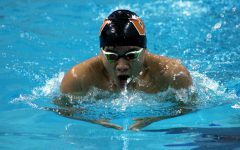 The Warriors also brought home two of the three athlete of the meet awards: K. Truong took Female Swimmer of the Year, while Greisdorf was awarded Diver of the Year. 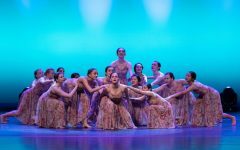 The team will compete next in Mansfield on Friday, Feb. 1 to Saturday, Feb. 2 at the Region 3-6A meet in hopes of securing a spot at State.